While we’re still trying to figure out where exactly 2017 went, the most wonderful time of the year is finally officially upon us. Charlotte has a plethora of ways to celebrate the holiday season: Whether you’re looking for a romantic date night, something your nieces and nephews will love, or you want to sing along to Christmas carols with your neighbor Fred at the top of your lungs and feel no shame about it, here are some of your best holiday season bets in the Queen City. #KeepPounding through the holiday season at the Panthers’ fourth annual tree lighting. It’s happening outside of their home at Bank of America Stadium. Look for appearances from Sir Purr, the TopCats, the Purrcussion Drumline, the Black & Blue Crew, and more. Plus, you’ll enjoy performances from the Charlotte Bronze Handbell Ensemble and Queen City Groove. Pro tip: Bring lawn chairs for optimal comfort as you take in the festivities. Be there for the Southeast’s largest Thanksgiving Day parade, now in its 70th year. Check out floats, performances from marching bands and dancers, and more. It’s the perfect way to kick off the holiday before your multiple food comas set in. If you want to make sure you snag a great spot for viewing the action, you can purchase reserved seating in advance. Sure, you could be elbowing people out of the way to get your hands on a 52-inch plasma TV on Black Friday, but in reality, is that what you want to be doing at the crack of dawn after you’ve just stuffed your face all day? Probably not. Instead, head to Historic Latta Plantation. You’ll check out the plantation home and grounds, which will be decked out in holiday decor authentic to the 1800s. You’ll see reenactments of how people who lived in that time period got ready for the season and watch how traditions evolved over the years. If you absolutely have the urge to get some Black Friday shopping in, why not benefit local businesses as you do it? Head to South End, where you’ve got over 200 locally owned businesses just waiting for you to make a purchase, plus 70 places to eat and drink when you need some refueling in the middle of your retail rampage. If you want to make it a true South End experience, park your car and take the LYNX Light Rail in so you don’t have to worry about finding the perfect spot. 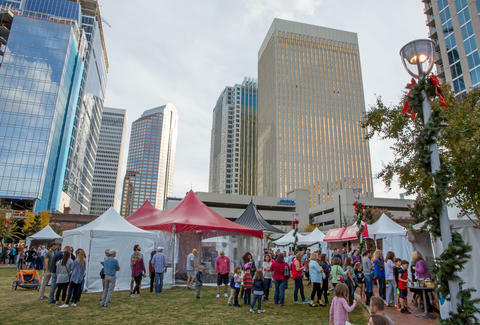 Even if you forgot to get your passport renewed, you can feel like you’ve jetted off overseas for the holidays when you visit this European-inspired market -- right in the center of the city -- in picturesque Romare Bearden Park. Snack on traditional treats like strudel, macaroons, and gingerbread. Sample bratwurst and glazed nuts as you sip seasonal drinks like hot mulled wine, hot cocoa, and cider served in souvenir mugs. Local performers will take the stage for a variety of entertainment throughout the day as well. The Olde Mecklenburg Brewery gets into the holiday spirit with its Weihnachtsmarkt (don’t worry if you can’t pronounce it.) It’s a traditional Christmas market that pays homage to the brewery’s German roots. Stop by and snag gifts from 40 local vendors selling crafts and baked goods. Plus, enjoy local beer on tap, mulled red wine, and authentic German treats. Is this stress of the holidays getting to you? Come unwind at an ultra-soothing holiday yoga class at the Assembly Room at The Foundry put on by NC Yoga Bar. This isn’t your normal flow. Decompress with a 60-minute session in a gorgeous, candlelit room, all set to holiday music. When class concludes, enjoy a glass of wine. It’s the perfect way to get ready for this insanely busy but fun time of year. Bring an unwrapped toy with you, since donations will be collected for the Salvation Army of Charlotte. An absolute staple of the holiday season, The Nutcracker is magically brought to life by the Charlotte Ballet. No matter how old you are, witnessing the performance is awe-inspiring and will get you ready for the holidays. Charlotte Ballet unveiled all new costumes and sets in 2016, so the show is even more spectacular than before. Bring a date, your mom, your nieces and nephews -- even Phil from the pharmacy -- and enjoy a little live theater. The Daniel Stowe Botanical Garden transforms into a winter wonderland for the holiday season. The entire property is enveloped in more than 600,000 twinkling lights. Wind your way through on your own or take a horse-drawn carriage ride for an added dose of romance (they’re available Thursday through Sunday.) When you’re done, warm up at the campfire with roasted marshmallows and hot chocolate. There’s also food available for purchase. Whether you've got that triple toe loop dialed in or you’re just proud to glide a few feet without falling, come ice skate in the heart of uptown Charlotte. The NASCAR Hall of Fame Plaza is the perfect venue for both amateurs and seasoned skaters alike. If you’d rather just watch other people try their luck, there are plenty of areas available for that too. But honestly, what's the point of that!? If you haven’t driven through McAdenville, North Carolina (dubbed Christmastown, USA) during the holiday season, then you definitely need to add this road trip to your list this year. It’s less than a half hour from Charlotte, so it’s easy to do on a weekend, or even after work with your neighbor Fred. For 62 years, the quaint town has put on an incredible display of lights and decorations. Each privately-owned house is completely outfitted for the season. Hop in the car, fire up some Christmas music, and drive through, or bundle up and take a walk on foot. McAdenville’s official tree lighting is Friday, December 1 if you want to plan a visit accordingly. The Charlotte Motor Speedway turns into a holiday spectacular each year, complete with 3 million lights. Meander through the 3.5-mile course as you check out the light displays and blast some Christmas music from your 1985 Firebird. You can also enjoy a drive-in movie experience Thursday through Sunday. Holiday-themed films like Frozen and Elf will be displayed on a giant screen as the corresponding audio plays through your car radio. If you think that the bar cart you just bought looks adorable in your living room, wait until you see the decor, landscaping, and architecture that the houses on the Fourth Ward Holiday Home Tour have to offer. From Victorian-style to ultra modern, you’ll see a wide range of envy-inspiring residences perfectly decorated for the holidays. The tour is easily walkable and self-guided so you can move at your own pace. As you go, take in performances from choirs and handbell ensembles, complimentary horse and carriage rides, plus food and beverages while supplies last. The Singing Christmas Tree returns for its 63rd annual performance this year. Watch as nearly 100 performers from the Carolina Voices choir assemble inside a 32-foot-tall tree structure to perform holiday favorites. It’s a unique way to hear lovely carols and fully embrace the holiday season. Sure, you can slap some frosting on sugar cookies and call it a day, but if you’re looking to offer up something slightly nicer as a thank you for the host of your next holiday party, sign up for a cookie decorating workshop at Sur La Table at SouthPark Mall. You’ll learn how to take an already delicious treat and transform it into an edible work of art. Starting at 6pm, Lenny Boy is hosting an incredibly fun dance party to shake your way into 2017. There will be live music, cheap Champagne, pitchers of beer, a food truck keeping everyone refreshed, and a new beer release. Also, no dress code and no cover, so grab all of your most fun friends. Lauren Levine is a freelancer for Thrillist.